We have contributed articles to several magazines. The list below is a summary of our articles with the most recent ones appearing at the top of the list. 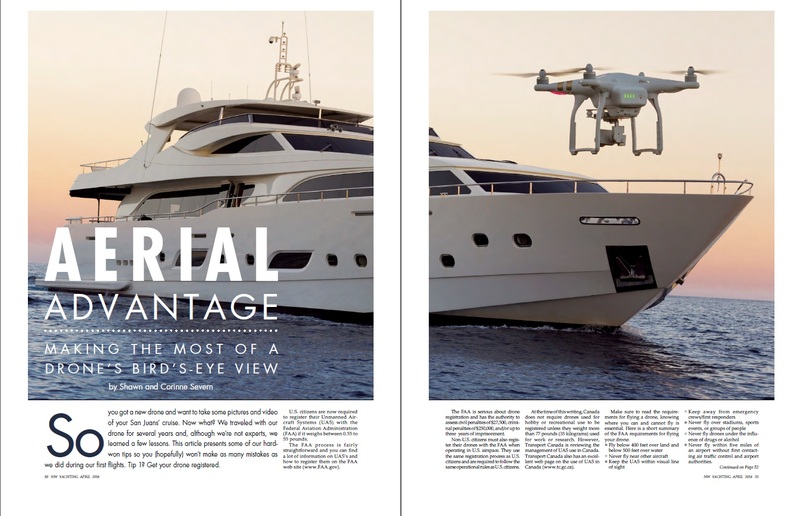 Aerial Advantage –Making the most of a Drone’s Bird’s-Eye View; Story and Photos by Shawn and Corinne Severn; Northwest Yachting; April 2016; pages 50-54. 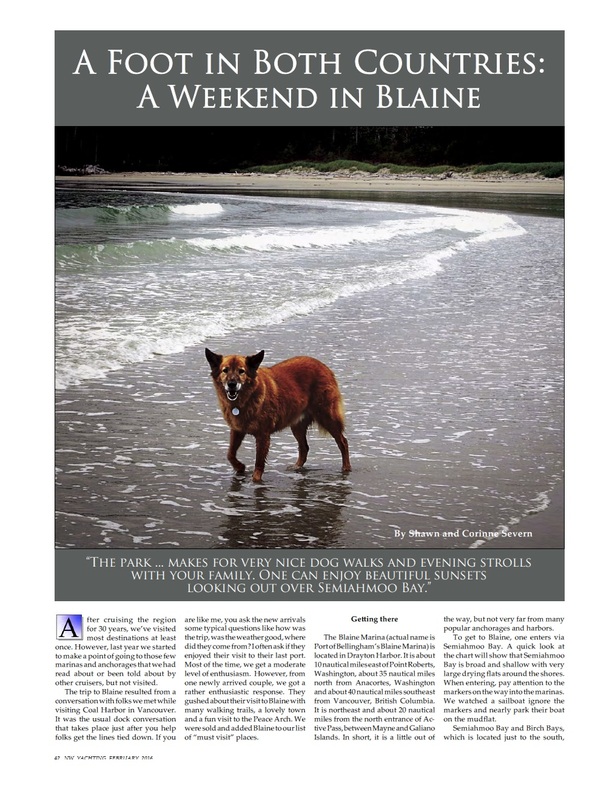 A Foot in Both Countries: A Weekend in Blaine; Story and Photos by Shawn and Corinne Severn; Northwest Yachting; February 2016; pages 42 to 46. 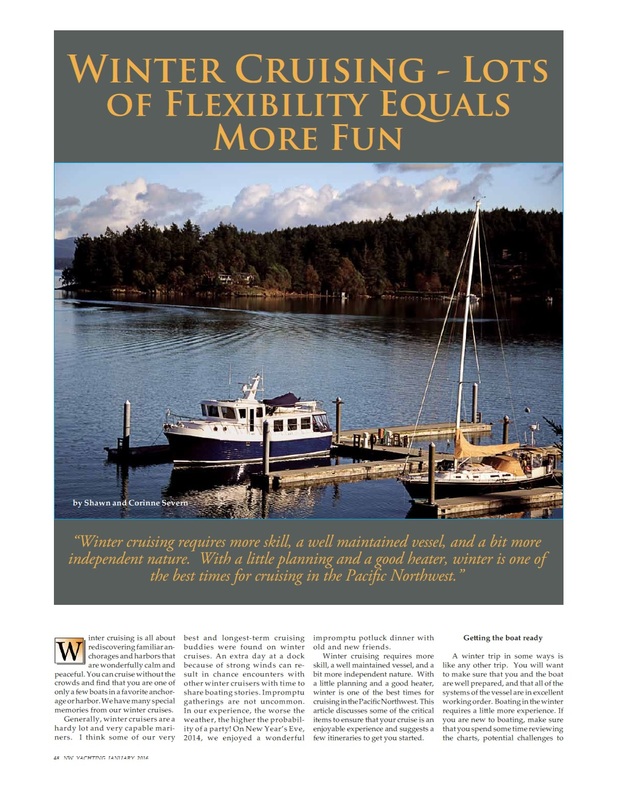 Winter Cruising – Lots of Flexibility Equals More Fun; Story and Photos by Shawn and Corinne Severn; Northwest Yachting; January 2016; pages 48-53. Almost Home; Story by Shawn Severn; Waggoner’s Pacific Northwest Boating; October 2015. Managing Your Boat Like and Pro – Choosing the Right Tender; Story and Photos by Shawn and Corinne Severn; Waggoner’s Pacific Northwest Boating; September 2015; pages 96 to 102. Stay Fit While Afloat; Story and Photos by Corinne and Shawn Severn; Waggoner’s Pacific Northwest Boating; July 2015; pages 78-83. Manage Your Boat Like a Pro – Before you Turn the Key; Story and Photos by Shawn and Corinne Severn; Waggoner’s Pacific Northwest Boating; June 2015; pages 60 to 64. Our Boat – American Tug 485 Salish Lady; Story and Photos by Shawn and Corinne Severn; Northwest Yachting Blog Site; May 2015. Dogging It’ In the Broughtons; Story by Shawn and Corinne Severn; Photos by Keith Short, Shawn and Corinne Severn; Waggoner’s Pacific Northwest Boating; April 2015; pages 70 to 79. Northwest Weather – Inside Passage Strategies Part 1; Story and Photos by Shawn and Corinne Severn; Waggoner’s Pacific Northwest Boating; March 2015; pages 32 to 39. Burdwood Group; Story and Photos by Shawn and Corinne Severn; Pacific Northwest Boating; December 2014; pages 51 to 53. VHF Radio 101, Story by Shawn and Corinne Severn, Photos by Duart Snow; Pacific Northwest Boating; November 2014; pages 70 to 77. Destination – Clayoquot Sound, Story and Photos by Shawn and Corinne Severn; Canadian Yachting; April 2014; pages 29 to 33. Perfect Docking Every Time; Story by Shawn and Corinne Severn; Photos by Keith Short; Canadian Yachting; March 2013; pages 28 to 32. A Bumpy Day – Cockpit Confessions; Story By Shawn Severn; Pacific Yachting; July 2008; page 178. Meet Mrs. Captain – Cockpit Confessions; Story by Shawn Severn; Pacific Yachting; March 2008; page 162.